Toenail fungus is an infection that gets in through cracks in your nails or cuts in your skin. It can make your toenail change color or get thicker. It also can be very painful. Because toes are warm and damp, the fungus grows well there. Left untreated, an infection could spread to other toenails quickly, skin, or even your fingernails. It is very common with 20% of the general population and 75% of people around the world over 60 years old affected. Most people experience scaling under the nail, which is called subungual hyperkeratosis. Sometimes the area under the nail itches. You may also realize a white and yellow streak on the nail, which is called lateral onychomycosis. If the nail gets thick, wearing shoes can be very uncomfortable. With time the nail may start to lift off from the nail bed, that’s when the nail infection is at its peak. A fungus grows in dark places, especially when they’re also moist and damp, the fungus also grows well in warm environments. Fungus infection is one of the few foot problems that affected more men than woman, because of men most likely to walk barefooted than women. 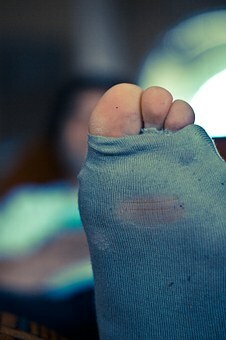 nail infection can also happen if you wear socks and shoes that don’t allow your feet to breathe. Therefore, proper ventilation for your feet is crucial if you want to reduce the risk of toenail fungus in the nail bed. You should always know what causes nail fungus to occur, while anyone can get toenail fungus some people are at greater risk, so here is the common cause of nail fungal infection, so you are able to take the right precautions to prevent it from happening and keep your nails healthy. Poor ventilation – As i mention before, sweaty feet or shoes that do not allow your feet to breath creates a breeding ground for toenail fungus. Because those shoes create a warm, sweaty environment that’s perfect for the development. Health conditions – Some medical conditions can increase the risk of toenail fungal infection, include a history of diabetes, poor blood flow, human immunodeficiency virus (HIV). And other medical issues that may cause damage to your immune system. Skin condition – Skin problem can increase the risk. Walking barefoot – If you walk without shoes a lot or share shower with someone who has an infection, you would need to take serious precautions. If you walk barefoot you can pick up micro-organism that’s left behind by someone with the fungal infection, so always make sure your feet are covered with a slipper. Family history – If you have a family history of toenail fungal infections, take time to inspect your feet daily and see a doctor promptly if you suspect toenail fungus. Nail polish – Heavy nail polish can cause toenail fungus because it tends to block light, creating an environment conducive to fungal growth, according to doctors. Hosiery – For ladies wearing a pantyhose can often lead to sweaty feet which potential breed toenail fungus. so before wearing hosiery, put some baby powder on your feet before sliding into your stocking. This will more likely reduce the possibility of fungus growth. Who is Mostly at Risk for Fungal Infections? if your family member has it you at high risk. There are four different types of nail fungal infections. Which Dermatophytes cause all fungal infections. Distal subungual onychomycosis, (DSO) it’s the most common type of nail fungal infection. It is caused by the same fungi that cause most cases of athlete’s foot (dermatophytes). The nail infection usually starts at the end of the nail bed, and part of the nail often turns yellow or white. Candida onychomycosis, it’s uncommon but can really damage the nail and the skin bordering the nail (nail folds). This type of fungal infection is more common in fingernails than toenails. Also, it attacks weakened areas of the nail, which may become discolored green, brownish or white, with an odd shape. White superficial onychomycosis, (WSO) this is the second most common type of nail infection. It can be easily treated. It normally affects the top layer of the nail, Eventually, the entire surface of the nail becomes covered with a chalky powder, crumbly look. Proximal subungual onychomycosis, (PSO) This is more common in people that are infected with the Human Immunodeficiency Virus (HIV). This fungal infection mostly infects the base of the nail. The base of the nail may appear white. The skin on top of the foot may become infected as well. Who should be treated for Toenail fungus? people who are experiencing discomfort, pain and also people with the higher risk factors infection such as HIV, diabetes and cellulitis. Everyone should be treated for nail fungal infection because the longer you have the infection the harder it is to cure. What specialists treat nail fungal infection? A dermatologist or a podiatrist can treat nail fungus, there are also several doctors that can provide treatment to cure your nail infection, also you can buy medication that can help to cure the infection as well online. Make sure to wash and moisturize your feet every day. Feet tend to get dirtier and sweeter than other parts of the body, so it’s important to have a good sanitary habit. You should also practice to wear the right footwear for each occasion, your feet will stay healthier if you wear proper footwear that’s designed to keep your feet clean, dry and at a comfortable temperature. Trim your toenails properly, every few weeks you can trim your toenails to keep them healthy and strong and avoid trimming them the incorrect way because it can lead to ingrown toenails. Can I Use Fake Toenails to Cover Toenail Fungus?